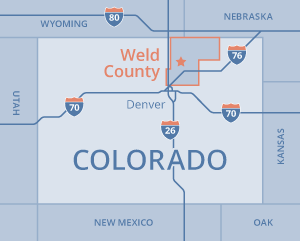 Weld County is strategically placed with ready access to utilities and transportation. Poudre Valley REA is an electric cooperative serving over 35,000 accounts in rural and suburban Weld, Larimer, and Boulder counties. Xcel Energy is a nationwide power company that provides electricity and gas to all of the major urban areas and many rural areas of Colorado. United Power is a rural electric cooperative that is a Touchstone Energy Cooperative. It provides electric service to homes and businesses throughout Colorado’s northern front range. The service territory includes much of South Weld County. At the end of 2010, the cooperative served more than 67,000 meters representing more than 120,000 customers statewide. Atmos Energy is the largest nationwide supplier of natural gas to residential, commercial, industrial, agricultural, and public authority customers. Builders and developers can contact a specialized SourceGas service representative regarding their energy needs by visiting the SourceGas Business page. BNSF Railway has a major line in the southern portion of Weld County and has lines that service multiple regions of the interior part of the county. They also have a major north-south line just to the west of Weld County. Union Pacific has a major north-south line that runs through the heart of Weld County and has another major line running diagonally through South Weld County. The Great Western Railway of Colorado owns and operates a total of 80 miles of track and interchanges with BNSF and UP as a vital link in Northern Colorado’s transportation network. GWR serves: Anheuser-Busch, Vestas, Front Range Ethanol, Eastman Kodak, Owens-Illinois, AllWeather Wood, Universal Forest Products, Amalgamated Sugar, and Wedron Silica, among others. Conveniently located in the heart of one of America’s fastest growing regions, the Greeley-Weld County Airport is the centerpiece for general aviation activity and development on Colorado’s famous front range. As one of Colorado’s fastest growing business aviation facilities, it has the ability to accommodate a wide range of commercial activities, making it “Colorado’s Perfect Choice”. DIA is just to the south of Weld County and is easily accessible from ExpressToll Highway 470. It is an international airport, the largest airport in the Rocky Mountain West area, and the 5th largest airport in the U.S. The Loveland-Fort Collins Airport is located in east Loveland (Larimer County) and just west of Weld County. Just west of Interstate 25, it is minutes from Greeley, Windsor, Firestone, Johnstown, and Berthoud. It is approximately 55 miles north of Denver.